Shown here is Lorna Greenlees and Peggy Fox displaying some of the unique items that were in the silent auction. Greenlees, who has been a part of the event since it first began, said, "We were really pleased with the number of people and everything went great." She added that "we had a lot of volunteer help and the houses were lovely … every year it grows a bit bigger." 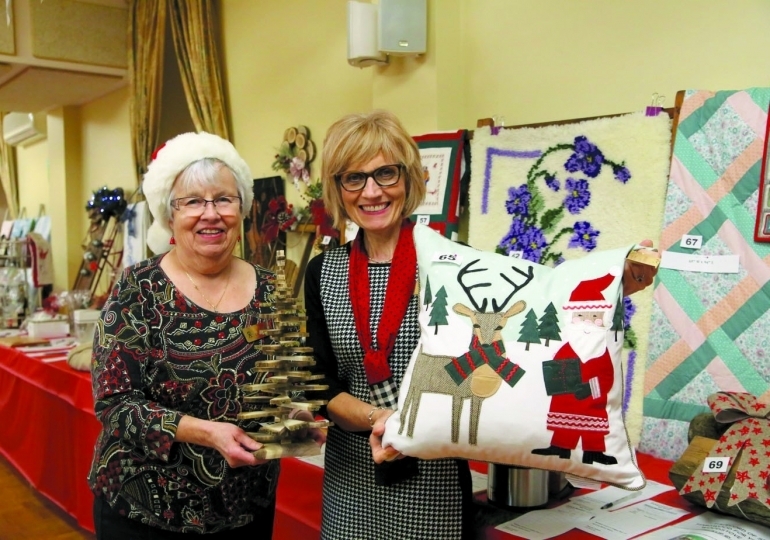 CALEDONIA—The 19th Along the Grand Christmas Tour of Homes and Bazaar took place November 16 and 17, 2018. The event is hosted by the United Church Women (UCW) of Grace United Church. Those who bought tickets were invited to tour three homes decorated for the season with items from local businesses and by the creative talents of the decorators. Everyone could also visit the bazaar to start or end their tour with refreshments, shopping, a silent auction, and more. This year over 500 people attended the house tour and even more went to just the bazaar. Previous articleSanta is coming to Haldimand!